Today I popped in at Brentwood on the Beach while I was in the area. I was delighted to meet a group of quilters who were on a retreat for four or five days from the Kitchener area. Many of them have been visiting Brentwood twice a year for over ten years to enjoy the peace and solitude and allow them time to focus on their hobby. I have about eight stunning quilts that were made by my maternal great grandmother, my paternal grandmother or my mother. I sincerely appreciate the hours and the work that goes into these beautiful art pieces as not only were they constructed stitch by stitch (no machines then) but the patterns were, I suspect sometimes challenging. The ladies at Brentwood are machine quilting – the work is still intricate and the results equally stunning functional art pieces. Wendy Chandler has been coming to Brentwood with the group for about six years to enjoy the collaborative work with like-minded crafters in a peaceful setting that’s not too far from home. She shared details of her project with me. 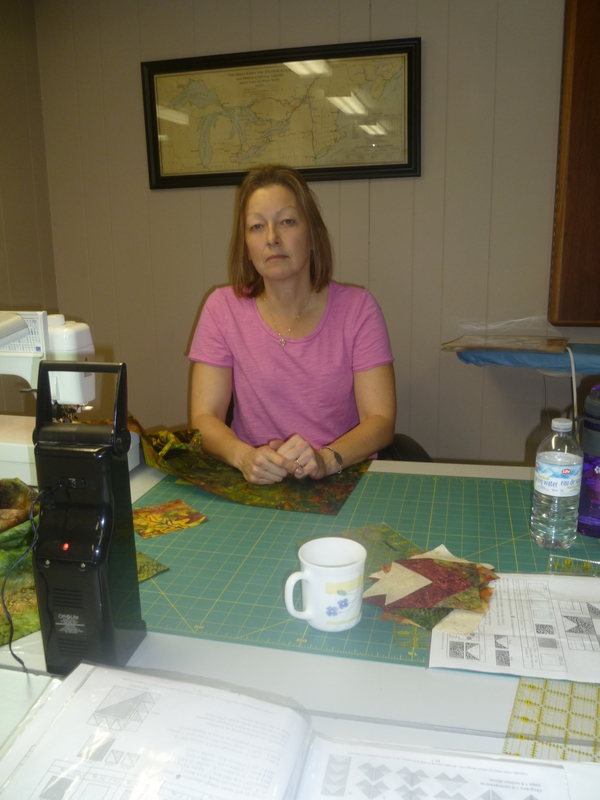 Wendy receives a “block of the month” package with fabric pieces already cut, ready for her to put together in a block. The pattern is included. 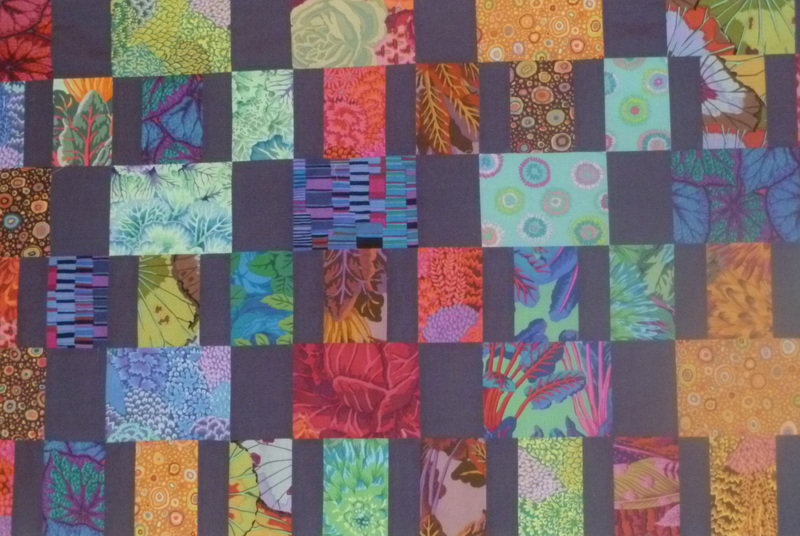 At the end of the year, the 12 blocks are stitched together for a full-sized quilt. The club she belongs to is through a quilting store in St. Jacobs although she did feel there were these types of projects available online or via mail order too. Wendy’s Block of the Month squares will come together at the end of the year to make this beautiful quilt. Megan Stauch is one of the co-ordinators of the biannual gathering at Brentwood. 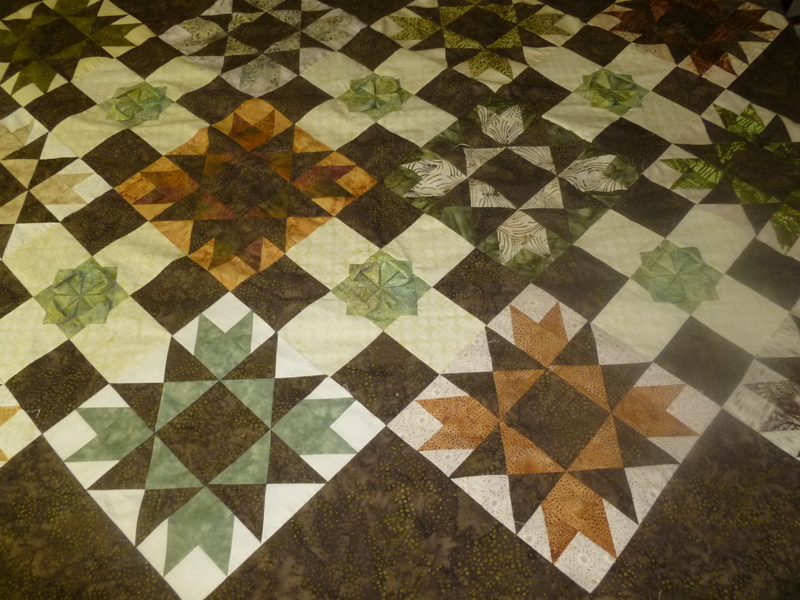 She was working on a modern quilt that included brighter colours and squares or rectangles rather than the typically more muted colours and triangular shapes of many quilts. She’s been coming to Brentwood for ten years and finds the area enticing – “the weather’s different every time we’re here”. (I love visiting Brentwood too as the view of the lake is stunning – no matter what the weather). Megan says she’s been quilting for just fifteen years but has made about 40 full size (Queen or King) quilts and 50 lap or baby quilts. Wow … can you imagine the work! Wendy’s ‘modern’ quilt features bright colours and squares or rectangles. These ladies also shared with me one of the projects being worked on by one of the other ladies. Describing the project as a block exchange, each of the ladies in the group were sent a package with a pattern and some of the “main” fabric. 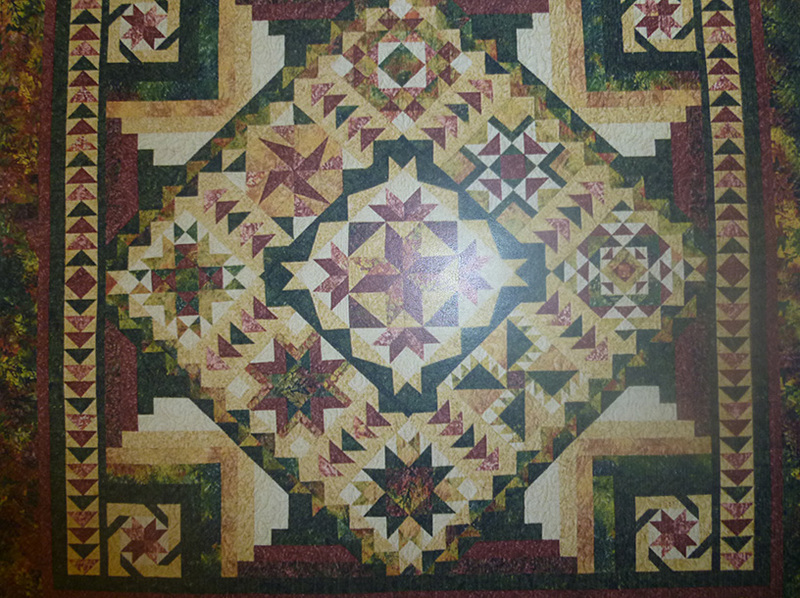 Each quilter completed the block with unique fabrics. A draw determined the winner who gets all the blocks to make a full quilt – colours and patterns chosen by each individual made for a really interesting outcome. These squares were made by twelve different quilters in twelve different places. The “winner” of the draw stitches the squares together for one unique and beautiful quilt. Brentwood hosts numerous crafters groups as well as individuals, couples or friends groups for getaways or retreats in their beautiful lake-front property on St. Joseph Shores – located between Bayfield and Grand Bend on Ontario’s West Coast. The property features an indoor salt-water pool, an outdoor barbeque area, access to the beach, beautiful gardens, cozy fireplaces and warm hospitality from owners/operators Joan and Peter Karstens and their staff. Catherine manages much of the day-to-day needs of the guests at Brentwood. 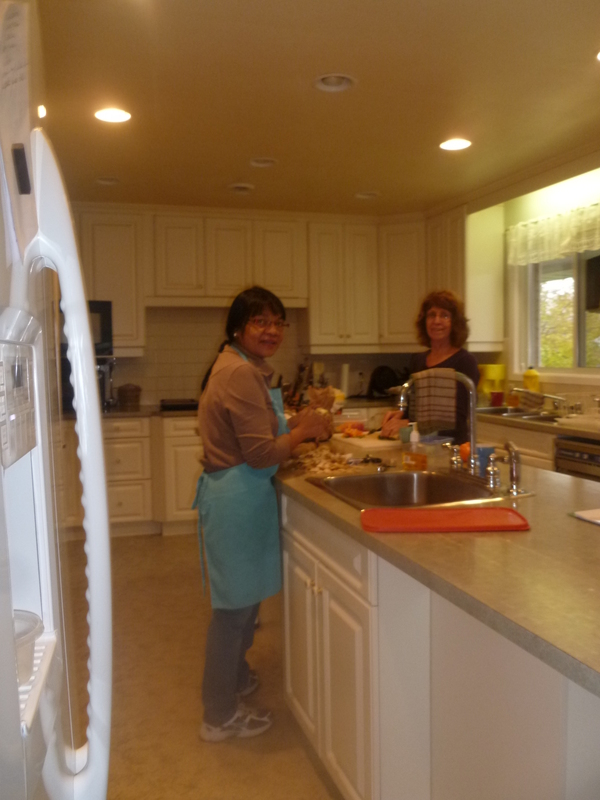 Hermie and Anita are in the kitchen preparing breakfast. Lunches and dinners are sometimes part of the package for hobby or spa retreat guests too.